All of our rooms have en-suite facilities and are furnished with 100% Egyptian cotton linen on the beds. The bathrooms are well stocked with a host of complimentary luxury toiletries as well as again providing 100% luxury Egyptian cotton towelling. Each room presents a free view flat screen TV. 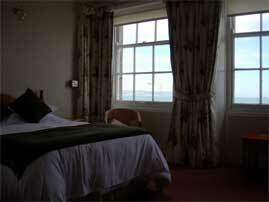 There are irons and ironing boards in each of the rooms as well as a well stocked complimentary tea tray. The tea and coffee is restocked daily or more often for those who enjoy their brew. The rooms on the front of the house have splendid views across Weymouth Bay and the beach and although the back rooms do not provide the spectacular vista that is Weymouth Bay, they benefit from being quiet, light and private – they are free from other buildings and not overlooked. For those of you arriving by car, your booking includes complimentary off road parking on the back of the Hotel. There are rules to the car park (link to car park rules), but the benefit of a guaranteed parking spot when you return to the Hotel after a hard day of site seeing, visiting tourist attractions, or just travelling south, is second to none. There will be no need to fight for a parking permit or even the even larger lottery of then trying to find a space in which to park your vehicle.